A Cardo Maximus was located in all Roman cities and military camps. It was the main north-south road that ran through the city and served as the center for the local economy. It was also the main branch for all other roads. The main east-west road was thesecondary road and was called Decumanus Maximus. When Hadrian ended the Second Jewish Rebellion (Bar Kochba Revolt) in 135 AD, the Romans rebuilt Jerusalem as Aelia Capitolina, and a Cardo Maximus was added. Beginning in 1967, major sections of this 1900-year-old street have been excavated, and are reused in today’s Jewish Quarter in the Old City of Jerusalem. 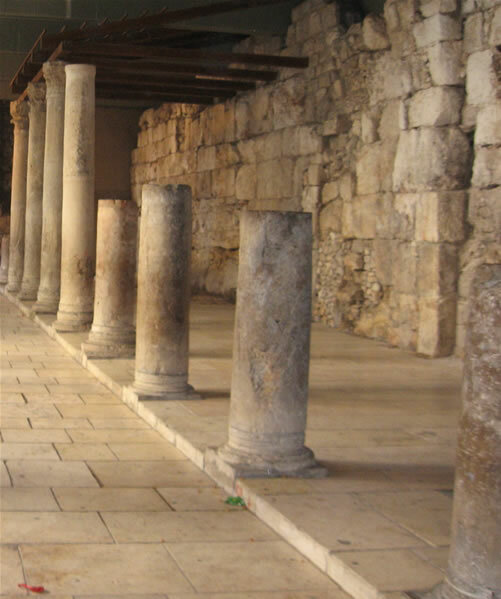 The entire roadway was originally 74 feet wide (the road itself was 40 feet wide with colonnaded and covered sidewalks on both sides to protect pedestrians from traffic and the heat of the sun). Shops were located all along both sides of the street. 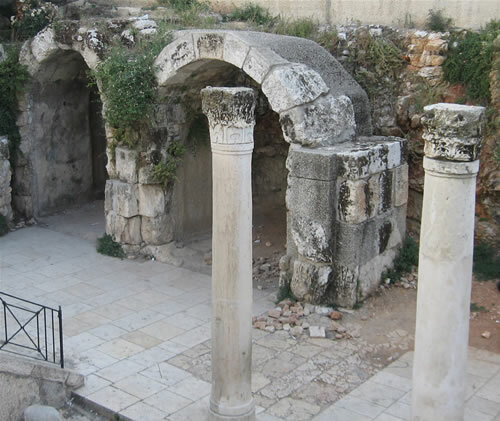 Hadrian began building the Cardo in the north of the city at the Damascus Gate in 135 AD. Later, around 527, the Christian Emperor Justinian completed the road so that the Church of the Holy Sepulcher was connected to the southern part of the city, past the Nea Church and the southern gate. on this map from 1500 years ago. 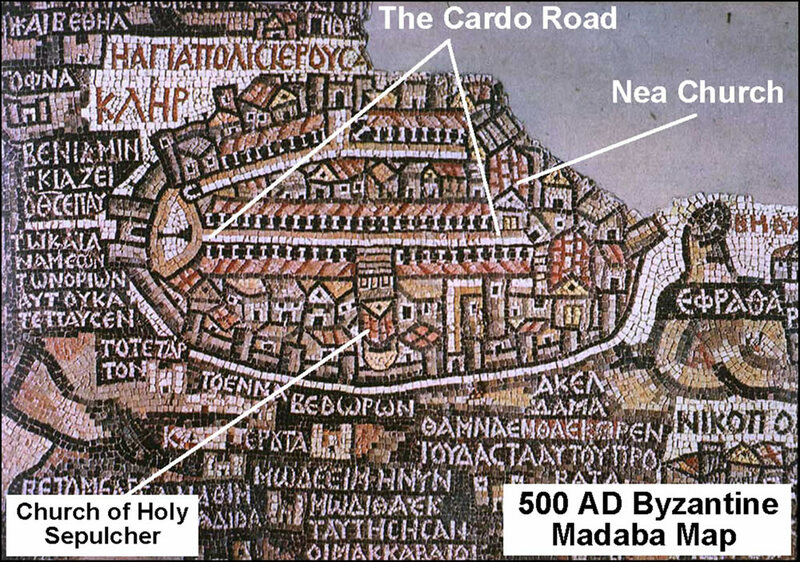 Also notice the so called Eastern Cardo, which is just above the Cardo Maximus on this map. The Eastern Cardo only has onerow of columns. The Cardo built by the Romans (135-312) and used by the Byzantines. The road is in the middle of the photo and extends to the left past the edge. (Imagine it without the modern square pillars.) 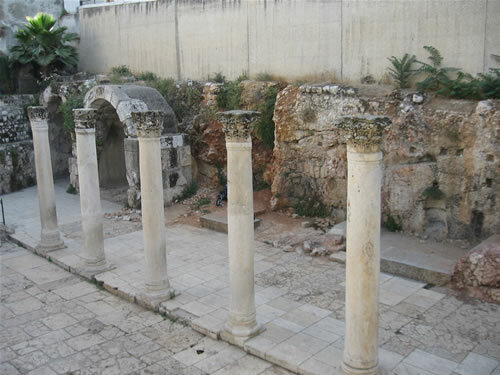 To the right are the original columns of the colonnaded street. To the right of the columns is the Roman sidewalk. Notice the square curb. Curb, columns and sidewalk were also on the other side of this street. The smaller rocks in the wall were placed to block an ancient shop entrance. Notice the modern city street level is about 20 feet above the street level of 135 AD. See the modern street in the top left, with a stairway coming down to the Cardo. 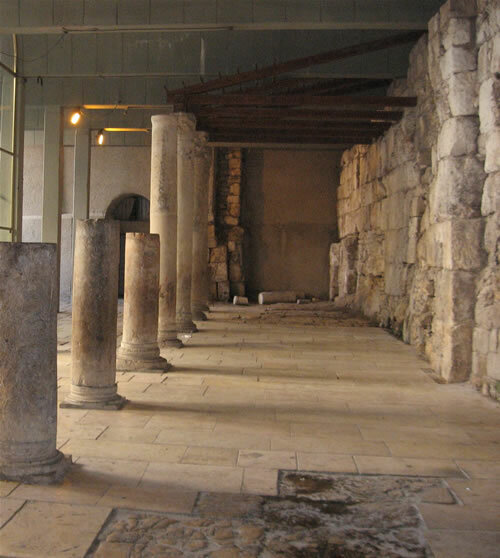 Ancient arched shop fronts and their vaulted rooms along the sidewalk of the Cardo in ancient Aelia Capitolina, the Roman Jerusalem. Part of the ancient Cardo that has been modernized. Notice the pavement and the ancient store fronts which are now home to modern shops. Toni is shopping under the Israeli flag on the right side. A very nice art shop that sells prints by local artists (at least one of whom also works in the shop) is on the right. Toni is shopping to the right under the Israel flag. The street is seen in the lower left corner. The curb rises to make the sidewalk which is lined with columns on the right side of the Cardo Street. The shops are located on the right side of the street. Two of the original arch shops can be seen in the top left of the photo. arched shop fronts can still be seen (top left quadrant). beside modern reconstructions (front bottom).